Double Cash Back Earn 3% cash back on all purchases in your first year up to $20,000 spent. Earning rewards on every purchase, without having to pay an annual fee. 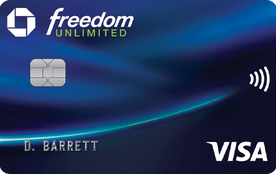 Pro tip: if you also have a Chase Sapphire card, you can transfer your Freedom Unlimited points to your Sapphire account to boost their value even more. The CFU is one of our top picks for the best credit cards of 2019. Our take: Casual users of the Chase Freedom Unlimited credit card may appreciate its simplicity and high general rewards rate, but the card’s real sweet spot lies in pairing it with other Chase Ultimate Rewards cards. Ratings and reviews provided by issuer as of 2019-01-29.